Like what you see? Interested in helping us? 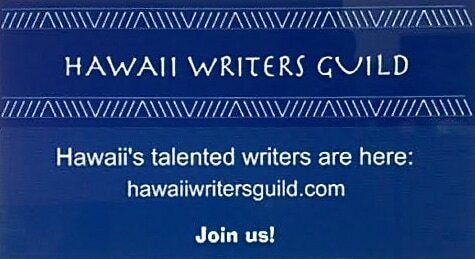 Then why not consider a donation to help Hawaii Writers Guild in furthering its mission and achieving its long-range goals. HWG has applied to the federal government for 501-3-(c) nonprofit status and we are awaiting approval. However, we can accept monetary donations in any amount. Your donation may be tax deductible but since we cannot dispense tax advice, you are advised to check with a tax professional on this matter. You can donate either by check, mailed to our official address at Hawaii Writers Guild, P.O. Box 393, Kamuela, Hawaii. 96743, or via PayPal, using your linked bank or credit card accounts. If you choose the latter, please click the Donate button below.